Apple on Tuesday reacted to news that the U.S. National Security Agency has worked on iPhone spyware to remotely monitor users, saying it has not cooperated with the agency on such projects and was not previously aware of those attempts. In an official company statement provided to AllThingsD, Apple vowed to use its resources "to stay ahead of malicious hackers and defend our customers from security attacks, regardless of who's behind them." The statement came after new documents showed the NSA has the capability of deploying software implants on the iPhone to grant access to onboard assets such as text messages, location data, and even microphone audio. While Apple was previously unaware of the NSA's spyware, the company said it's constantly working to make its products more secure. The iPhone maker said that any reports about potential security issues on its products prompt Apple to "thoroughly investigate and take appropriate steps" in order to protect its customers. The statement also declared Apple's product security as "industry-leading," and boasted that great effort is placed on making it easy for customers to be able to easily keep their software up to date. To that end, the most recent data from Apple shows that 78 percent of iPhone, iPad and iPod touch users are using iOS 7, the company's latest mobile operating system. 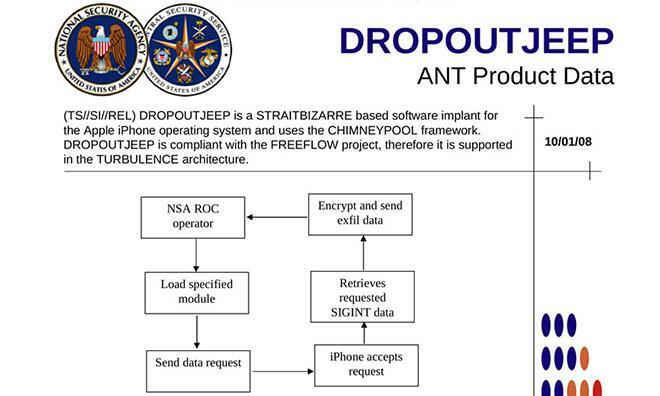 The leaked documents reveal that the NSA's iPhone-targeting spyware program is called "DROPOUTJEEP," and it began in 2008. Capabilities of the software include the interception of SMS text messages, access to onboard data, microphone activation, and approximate positioning via cell tower location. The NSA boasts a 100 percent success rate in implanting its spyware on iOS devices, but the leaked documents suggest that physical contact with a target phone is required to implant the software. Apple's full statement in response is included below.